deviantART muro is a free online image editor that gives you superior speed, function and flexibility compared to any other web-based drawing service. And it does that in a completely free environment. 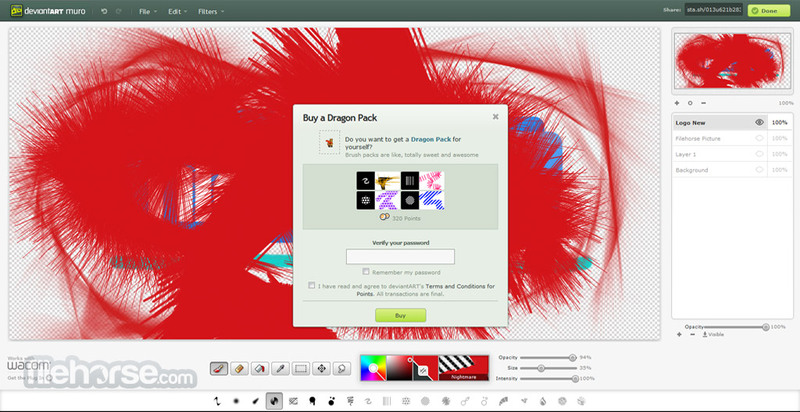 Not only does it support working with layers, pressure sensitivity drawing, over 20 brushers, but it also seamlessly integrates popular deviantART social network sharing. By using intuitive interface and easy-to-use tools, users of all knowledge levels will feel right at home and be able to create whoever is on their mind. deviantART muro is powerful, easy, and offers fantastic drawing environment to express your creativity on the web. Great free online image editor! If you take just a surface look on the modern state of the internet, quick search query will show you that you can find online image editors on countless locations, all offering their visitors access to more or less competent set of tools and services that enable them to paint, modify, edit and share their creations. However, if you are serious about your art, you need to take a closer look at the image editor that is created, hosted and offered to be used or free by the largest art image hosting websites in the world – DeviantArt. deviantART muro is highly competent image editing application that is directly infused into offering of DeviantArt, enabling its users to create, save, manage and share images that they have created with this editor directly into their main DeviantArt profile, when anyone can access them with ease. Great free online image editor! Popular online social community DeviantArt managed over the last decade to attract more than 250 million fans, which all came not only to share their incredible looking creations that cover all areas of fanart, but also to create new images directly on that site. For that purpose, developers of this famous service managed to create deviantART muro, a fully integrated online image editor that can be used for free to create any type of modern painted art. 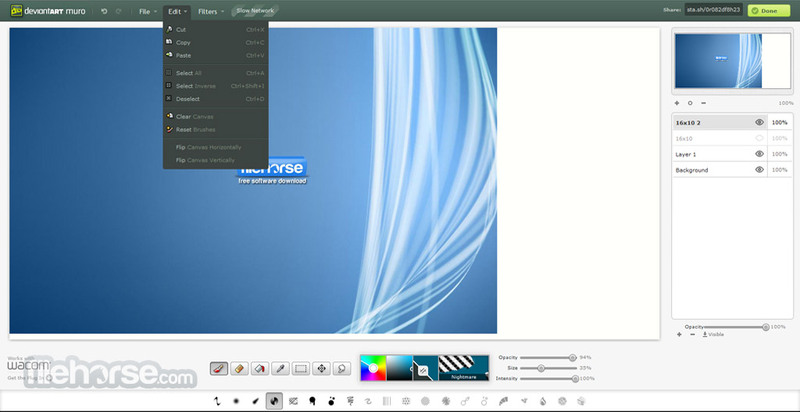 Hosted by DeviantArt and accessible directly from your browser without the need of any plug-in or extension, giving access to empty canvas, more than 20 types of brushes, basic and advanced tools for image manipulation, color pickers, adjustment tools, presents, and most importantly Layering tool. Using this simple tools that are arranged inside excellent looking dashboard, both novices and professionals will have easy way to express themselves. 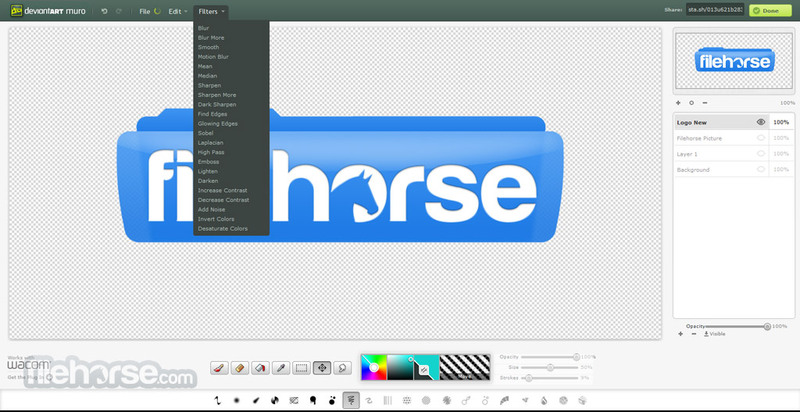 It is important to notice that work that is created in this webapp can be saved for later editing only by members of DeviantArt (free registration that can be done even from within this editor), but everyone can export currently active image to local storage, making this app very attractive to random visitors. One of the most famous parts of deviantART muro is its ability to record the brush movements that painter has made, enabling him to share his procedure of painting to anyone. This can enable community of some artist to see firsthand every brushstroke that he made in timeline of events that is moving fast. This painting showcase is today more and more popular in many other online editors. Interface of deviantART muro is very sleek and modern, with flat and stylish design that promotes both functionality and attractiveness. 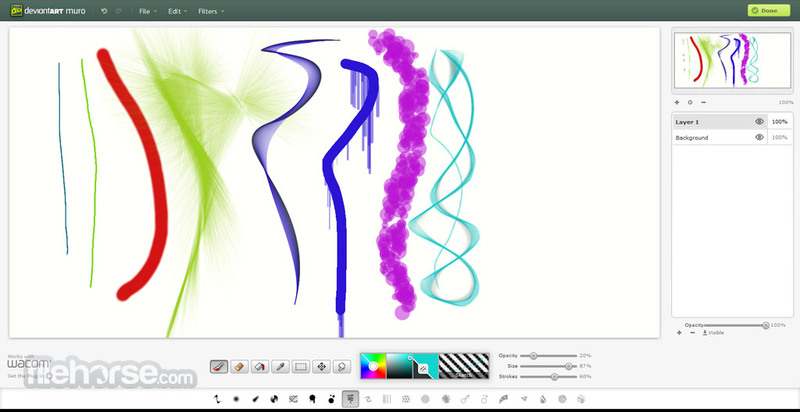 Main canvas of the app is surrounded by bottom tool area that holds everything that you will need to to do control your painting process, while on the side large bar is holding remainder of advanced tools – Draw section (management of layers), Adjust (image composition and color tweaking) and Presets (with large array of tools that can drastically change the form of your image). All tools are easily accessible, and can easily be used both by novices and professionals. deviantART muro can be used for free without any limitations. Free account is needed for saving of your work for later use. If you are interested in expanding your online presence and finding a location where your original works can be not only stored but also created, you need to visit deviantART muro now and see all that is has to offer. 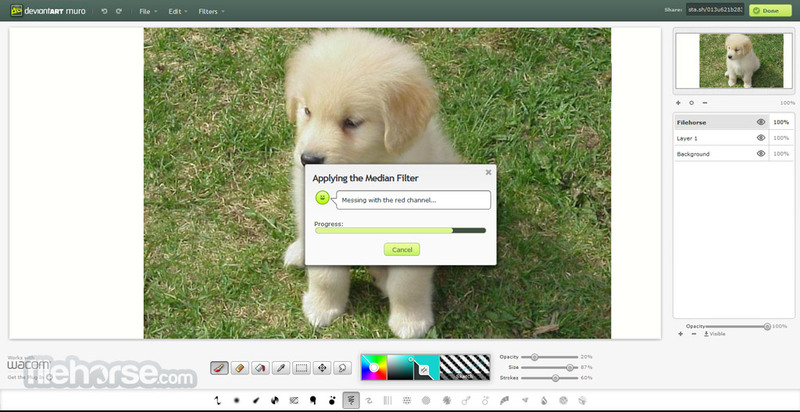 Easy and powerful free online image editor!